When me and Daniel decide to showcase videos on the blog we’re often wary of the length, as we know many people can get distracted when watching long pieces. Today I’m going to throw this rule out of the window as I point you towards a piece titled ‘Place of Hope, The Kasama Community and the Great Ordeal’, directed by Henry Mochida and Mike Douglass. It’s a 26 minute film and was made to tell the story of potters in the historic town of Kasama where they’re joining hands to create an inspiring movement to rebuild their craft and livelihoods. Kasama, a small town in Ibaraki Prefecture north of Tokyo, has long been popular for its pottery, many people come from all over world to study pottery with Kasama’s masters. 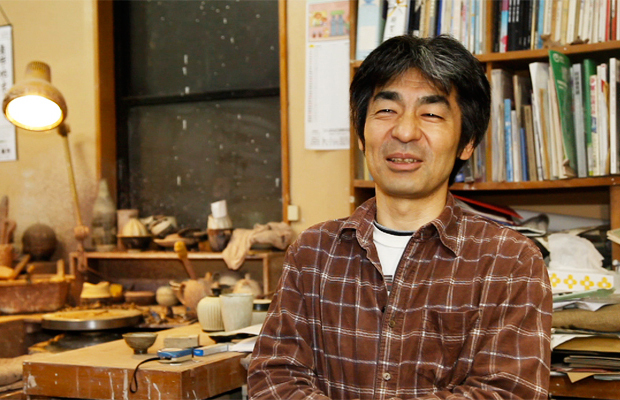 The lead character in this video is Akio Nukaga who’s the potter who spearheads the movement to Save Kasama Potters. He’s a really inspiring creative who’s both humble and talented, in fact Akio really captured my attention today and made me think about what I’m doing and the way in which I could help people in the community. Quite an eye opener. As you know Japan experienced a devastating earthquake in 2011 and the potter craft-community suffered tremendous damage that destroyed many of the noborigama kilns and shattered thousands of ceramics. The craft lifestyle, already threatened in the machine-age, faced near destruction from the earthquake. With the potters abilities to practice and have a livelihood in peril, the potters had but one choice, to come together to help rebuild their craft lifestyle. It’s really heartwarming hearing the stories of the potters and how they went about reconstructing the broken kilns, also the attitude they have which is most inspiring in my opinion. It’s almost as if they’re picking up right where they left off and are continuing onwards and upwards, working hard and making a new path for themselves. For example updating the kilns so they’re better than they were before, also trying out new styles and techniques, I’m sure this disaster has also changed the mentalities of the ceramicists and has inspired them to keep going and to tell their story. So I’d urge you now to watch this documentary below, it’s a real treat and will set off your night nicely. For anyone interested this film will be available to buy on DVD via the R3IMAGE website very soon, which is linked below, so please head that way and show your support for this project. Hopefully this isn’t the last we’ll hear from the Kasama community.